It always amazes me how the designers of card model ships are able to achieve so much detail in their models. 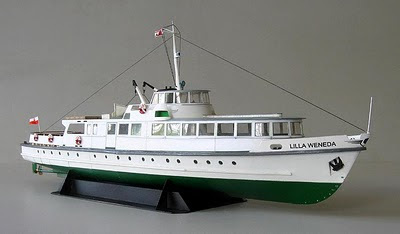 This 1:100 scale paper model of a Polish coastal ferry is one such example. Roman Detyna of digitalnavy.com designed this model to commemorate the tenth anniversary of his website. Detyna chose to create this particular ship because of a fond memory he had of sailing on such a ship as a young boy. The template for the ship may be downloaded here. In mathematics a torus is defined as a geometric shape created by revolving a circle in three dimensional space about an axis coplanar with the circle. Some examples of objects with torus-like shapes are doughnuts and inner tubes. Torus shapes can be deformed into "knots", that is closed, intertwined geometric forms with no beginning or end. 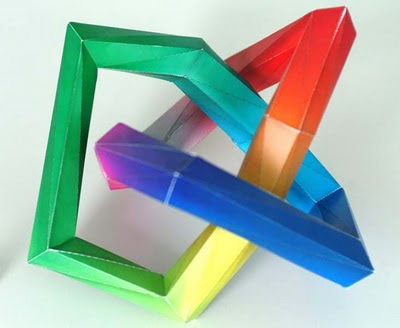 This colorful papercraft torus knot is the work of Matthias Baas of Germany. The knot's template is interesting in that it is designed to be printed double sided so that the printed fold lines all occur on the inside of the model. The PDF template for the knot is located here. Every once in a while I feel the need to post some origami. :) This Star Wars A-wing starfighter was folded by Jens-Helge Dahmen and is a modification of a folding pattern originally created by origami artist Adam Black. 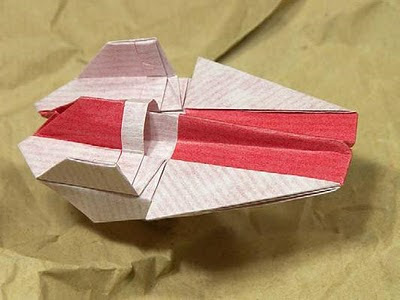 All that is required to build the A-wing is a 20x20 cm square of paper that has color on one side only. Gift wrap paper might work nicely. Dahmen's folding pattern for the A-wing is available for download here (look for the link near the bottom of the page). It is not every day that you see a papercraft model that is as poseable as this toy robot, so I was really impressed when I came across this little fellow. The creation of Japanese designer, Toki, this papercraft may be downloaded at the Pepakura gallery website here and is only available in Pepakura's PDO format. 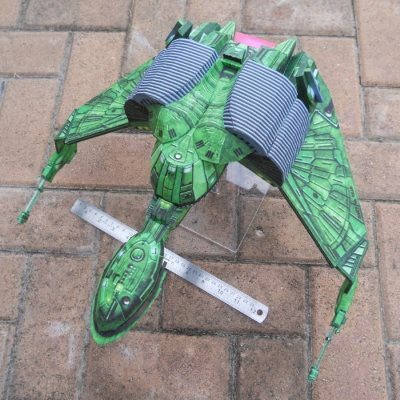 Judging by the template, it appears that the finished robot is less than 7" (17.8 cm) tall. Detailed photographic instructions are included in the download, although the text is in Japanese only. Here's another papercraft from the guys at the Mech3.org forum. 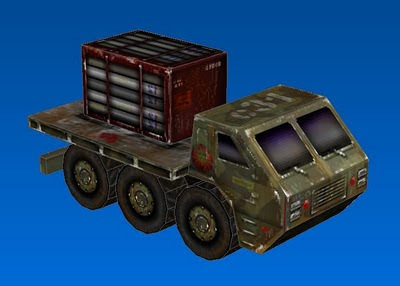 This MechWarrior 4 cargo truck was 3D modeled, texture mapped, and unfolded by forum member "SHIFTDEL". Available in Pepakura PDO format only, the template may be downloaded here. Building this 1:40 scale model looks to be relatively simple as there are only 14 parts contained on 4 pages. Just the thing for a beginning papercrafter! Monkey:Journey to the West is a nine act contemporary opera inspired by a Chinese legend about the adventures of a monkey who hatches out of a stone egg. 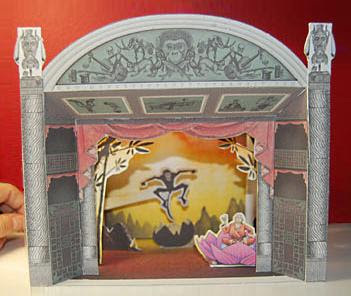 The production of the opera involves acrobatics, singing, animation and electronic music by the co-creators of Gorillaz. What's not to love about this opera? The first personal computer I can remember working with was a 1984 Macintosh 128K by Apple. The Macintosh was the first commercially successful computer to feature a mouse and a graphical user interface. The tiny (by today's standards) black and white monitor was built in. 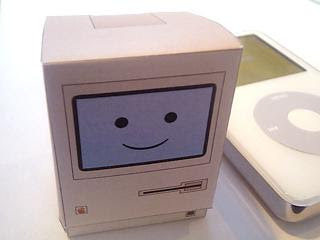 The one piece template for this cute mini paper version of the original Mac is located here at this Japanese blog. Happy building! 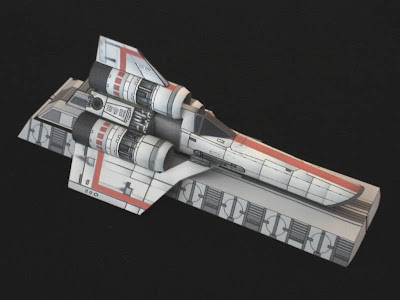 Papercraft designer Ninjatoes recently released a Colonial Viper Mark II model, but before the Mark II there was the Viper Mark I which appeared in the original Battlestar Galactica television series that aired in the late 70's. 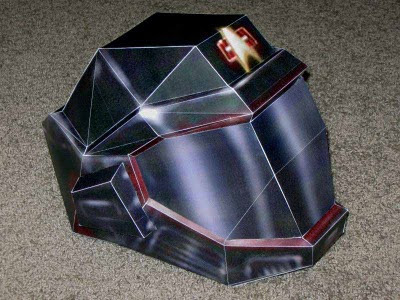 This papercraft Mark I is a rework by Fred Smith of a Viper template from a Japanese website. Fred has done a great job giving the Viper a weathered look and he also has designed a launch rail on which to display the starfighter. Fred's templates are available for download here. In addition to the red striped Viper pictured, there is also a template for a blue striped Viper. The former Soviet Union developed numerous spacecraft for space exploration, but most of these vehicles were never put into service. 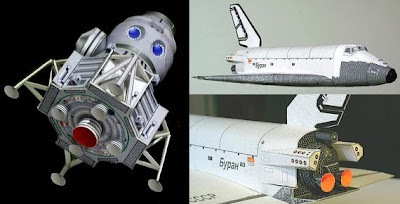 Two paper model examples of these prototype Soviet spacecraft are pictured above. On the left is the LEK Lunar Lander which was developed in the late 70's. It was intended to function in the same way as the US Apollo Lunar Module. On the right is the Buran Orbiter, a rival of the US Space Shuttle. After one unmanned flight in 1988, the Buran project was abandoned. Both these paper models are the work of Leo Cherkashyn. The templates may be downloaded here and here.